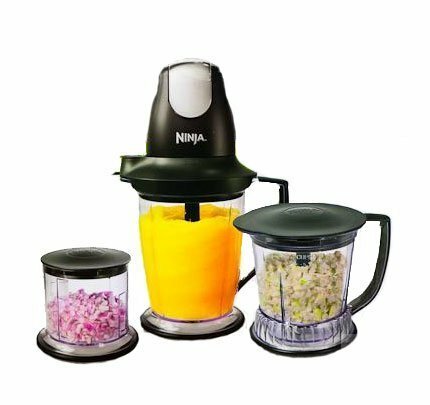 My mother bought me a Ninja Professional Blender set (the exact one pictured below) as a gift. 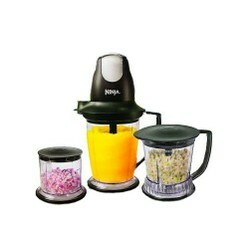 She raved about how handy it is, especially for making icy drinks and smoothies. After using it for a few weeks, I was a total convert. The Ninja is a fantastic kitchen tool! The set comes with the motor attachment, three different mixing containers -- small, medium, and large, plus lids and blades. I love how it has the three mixing containers because sometimes I may need to use the Ninja for two things in one meal. Or maybe leftover smoothie is in the refrigerator, and I need to blend something else. No problem. With three mixing pitchers, there is always one clean in the cabinet, ready to be used. One huge benefit of the Ninja is that it is seriously powerful. It grinds through ice cubes with no trouble at all. No coffee frappuccinos with hunks of ice. The Ninja blends it smooth so that using a small straw is no problem. Our favorite is to make frozen lemonades in the summer. Mix these ingredients in the Ninja and blend until smooth. Add sweetener to taste. The parts are all top rack dishwasher safe. But even if you prefer to hand wash them, they are not too hard to clean. I do recommend rinsing them immediately after use, though. But then again, that is just good dish washing procedure. Dried on food is always harder to clean off. Generally a few swishes in hot soapy water is enough to clean the blades. My mother was the one to introduce me to what she calls "mystery punch." It is a beverage made up of a lot of orange juice and all the over ripe fruits from the fruit bowl -- bananas, peaches, strawberries, nectarines, plums, mangoes. Sometimes she dresses it up with a dash of Sprite after pouring in on ice. She has been known to hide veggies in the mystery punch -- spinach, tomatoes, and carrots. I've never been able to distinguish the flavors of the vegetables. Instead, it just tastes like a fancy mixed fruit punch. And those are the beauties of the Ninja made smoothies or mystery punch -- you don't waste those brown bananas and you can hide healthy fruits and veggies in a delightful drink. It's easy to get carried away with the smoothie, especially if you have a lot of ripe fruit that needs to be used up. No problem. Make delicious and healthy frozen treats with any leftover smoothie. 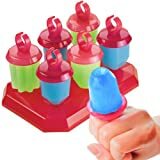 Just pour the concoction into popsicle molds to freeze. You know that you are giving your children a truly healthy summer snack, made from real fruit. Forget weird ingredients like xanthan gum and maltodextrin that you find in a bottle of store bought salad dressings. You can make wholesome salad dressings bursting with flavor for a fraction of the price. Here is a basic dressing that gives you lots of room for experimentation. Put the ingredients into the small mixing bowl and pulse until smooth. Refrigerate any unused dressing for later. I use lots of onion, pepper, and garlic in my kitchen. I love both the flavors and the health benefits that those aromatics provide. When time is short, I pull out my Ninja to do the messy chopping work. It doesn't take long at all -- just a couple of seconds -- to mince onion or pepper. Finely chopped veggies are perfect for people who are a tad picky. If they can't see the veggies they don't like, they usually gobble up the foods. I love to chop up carrot or zucchini with my Ninja and add that into sauces and casseroles. Added nutrition without any "What's in this?" questions. I haven't found a whole lot that the Ninja doesn't do well, but there are a few. Oh I do love a well-designed kitchen gadget. I have owned this Ninja for over a year now and my kitchen life changed when I bought it. It is so powerful and so easy to use and the fastest clean up. It is always out on my counter, ready to use. It is absolutely the best for smoothies and coffee drinks. Thank you for your fruit salad dressing recipe. I never thought to add fruit to my recipe. I also hadn't heard of the Ninja before, but now I have to have one. Thanks. I hadn't heard of the Ninja. It sounds great. I love the idea of having three mixing containers. Very handy! A personal blender is a handy kitchen appliance because you can make a smoothie in no time at all and clean up is a breeze. Did you know that you can find a great blender under one hundred bucks? Here are the top rated blenders available today for your budget.